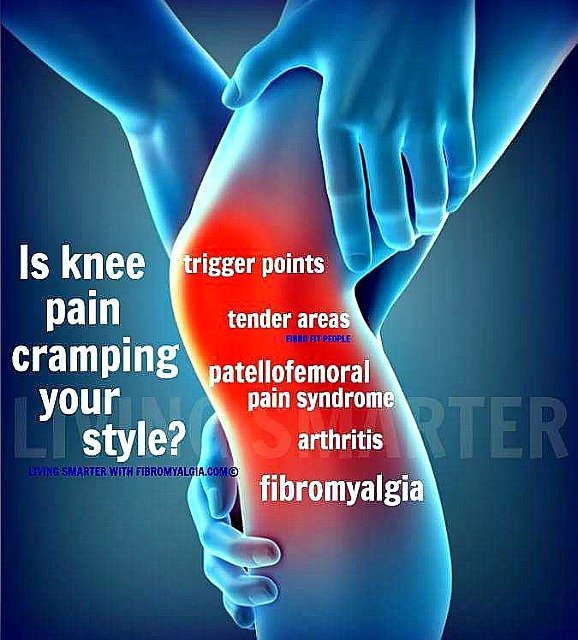 Do you have fibromyalgia knee pain? Do you experience pain in your knees upon standing from a sitting position? Do your knees often feel like they are buckling under you while standing in one place or while walking? This could be due to active or latent trigger points around the leg muscles. Do you find it especially hard or nearly impossible to engage in certain activities of daily living like cleaning a bathtub or a floor where kneeling or bending is required? These are all common within the fibro body, especially due to the weight bearing nature of these tender and trigger point areas. Like other joints, this area of the fibro body is also sensitive to weather and temperature changes and may cause a feeling of extreme weakness and increased pain around the joint and soft tissue surrounding the knee. With fibromyalgia knee pain, we are best to keep the blood flowing around these tender areas and work on staying conditioned with non-invasive remedies and strength applications where possible. Compression is a great way to naturally increase circulation. Compression wear is a non invasive remedy for knee pain that gently hugs and supports the joint, trigger points and soft tissue around the knee. Some compression garments include infra-red technology for even great benefit. 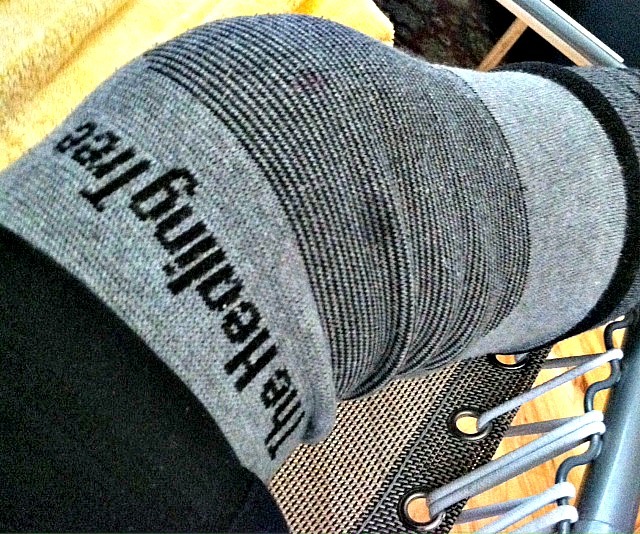 Knee compression garments like this one shown (the healing tree) can be worn any time of day. However, not all compression garments are appropriate for those with fibromyalgia due the differing degrees of 'tightness'. Experiment to find what rate of compression works best. This one shown exerts a smaller degree of compression but also includes the infra-red technology which in itself will increase circulation and oxygen flow around tender and trigger points of the body. Using light ankle weights and performing leg lifts to increase leg strength is also essential. It does not have to be a great deal of weight, just enough to start activating muscle and increasing strength slowly. The adjacent picture also shows a simple way to lightly ‘compress’ the area around the knees by using a small exercise ball and just squeezing in between the knees. Compress just enough against the 'tender' tendons and soft tissue.. Simply squeeze the ball... hold... and release. Use 8-10 repetitions for 1-2 sets. Remember that healthy muscle protects bone and healthy bone/joints protects muscle. Alternating ice and heat is always a good idea. 20 minutes cold/20 minutes warm. However, after exercise or strenuous activity, I find that ice or cold to decrease any soreness is best if tolerated. If you don’t tolerate the extreme cold of an ice pack, wrap the pack in a towel and work up to tolerance. For those who are a little more adventurous, how about a hot/cold shower? This is simply alternating hot and cold water for about 20-30 seconds at a time. Focusing on a particular body part like the knees or lower back will increase circulation without undue stress to the entire fibro body. I use the same wraps for my knees that I use for around my head during intense migraines. However, with a headache, the cold part only goes around the back of the head, for knees, it wraps around the entire knee. Check out the migraine article if you like for the cold wrap. Very easy to use on the knees as there is no need to hold it on them. Be careful with blood pressure or other issues that may not respond well to extreme temperature variance. It is also important to note that chronic lower back pain and tight hamstring muscles (back of legs) can also exacerbate knee pain. If your lower back is ‘out’ or you are over compensating in any way, often the knees can take on the added strain. SI joint pain (in the dimples of the lower back) is also connected to knee pain, so regular care for the spine and lower back can improve pain in the lower extremities and knees as well. Knee pain can also be exacerbated by tight fascia. Please visit the article on Myofascial Release by using the Sitemap and/or related links below. Also, join me on my facebook page FibroFitPeople1. Bowen therapy and/or Myotherapy can be helpful for fibromyalgia. This can be effective for related symptoms that affect both muscle and fibro tender areas. Check for a qualifed Bowen therapist in your area. Also refer to related links below. Another effective and less invasive procedure than something like cortisone for knee pain and arthritis involves cartilage injections. I have personally used these injections for my knees over the last three years. Check in your area for a holistic joint doctor. Our bodies naturally lose cartilage as we age, so it is something we need anyway. Often pain for by insurance. Prolozone therapy is another option for knees. This therapy utilizes oxygen, and may be injected with a natural anti-inflammatory into the surrounding areas of the knee joint. Not always paid by insurance.